EngagingPatients.org Students Support Community Health on Their Way to Health Professions - Welcome to EngagingPatients.org! Editor’s Note:The Health Professions Affinity Community (HPAC) program at Northeast Ohio Medical University was named a finalist for the 2017 Sherman Award for Excellence in Patient Engagement. The HPAC program promotes community health by empowering high school students to address persistent health disparities and challenges by enacting health projects in their communities. The program supports the students as they complete high school, enter college, and ultimately enter health professions’ training pathways. In this way, HPAC helps compose a future healthcare workforce for and from the communities that need healthcare the most. As HPAC students progress, they serve as change agents and role models and partner with their local healthcare systems. Weisblat also wrote about the HPAC program in December 2016. Please also see her earlier post and join Engaging Patients in congratulating her and her colleagues for being a Sherman Award finalist. LeShon, from inner-city Cleveland, Ohio,lost his father to drug addiction and anger management issues. LeShon’s Health Professions Affinity Community (HPAC) group works on these same challenges with the younger kids in his community. Through his work, he aspires to be the first in his family to finish college, and to get a nursing degree. He wants to care for his community. Fast forward two years: LeShon remains in college on the path to a health profession but struggles through the trials of making it at college, given his narrative of living below the poverty line in one of Cleveland’s most challenged communities. Contrary to expectations, he is making it. His HPAC project built him a support of networks in his community and externally. Together with his self-management skills and motivation, these resources are allowing him to build a future despite the statistics. Community matters, and LeShon has learned how to be a community member. His HPAC experience taught him to organize his thoughts and set goals and timelines and be accountable. It also made him aware of resources in the community and taught him how to put them together to make a difference. Northeast Ohio Medical University (NEOMED) shared a post recently about the Health Professions Affinity Community (HPAC) program, which is aimed at reducing the shortage of healthcare professionals, while addressing the health needs of the community with students from within the community. The program has grown from a small pilot program in Cleveland to one of the largest pipeline programs in the country, serving approximately 2,000 high school and college students across the state of Ohio. In doing this work, it has become clear to me and many of my colleagues, students and friends that health is an essential aspect of community vitality. Yet the health of our nation is failing in many aspects, especially for our most underserved populations. I have come to believe that healthcare—prevention and the service of providing care—is a basic need for survival, and that health must be seen as a community good much akin to national security. It impacts every member of society. HPAC builds on the awareness that 60% of our health depends on the social determinants of health that impact us as individuals and in our communities. Unfortunately, our current approach to healthcare can be characterized as individualistic rather than community-oriented, as reactive versus preventative, and as dependent versus shared. This has impacted the training of healthcare professionals, the delivery of healthcare services, and the perceptions of health and healthcare within our communities. The very design of our health care system has embedded health as a good that depends on economic capital rather than as a basic human need for subsistence and the overall success of society. Anna’s younger sister was already on the edge; Anna found weed in their room and hid the fact that her sister was texting at all hours and was clearly intimate with a boy. Anna wanted to help her sister make it, and she knew from experience the transition from middle school to high school was bumpy. As Anna puts it, “This is a time when things get wooly and you change friends, people think you are grown; you think you are grown… the crossing looms.” Anna recalls how afraid she was when she walked the 200 feet across the parking lot to the high school. She, like many of her peers, had a family that lived on the edge, paycheck to paycheck and from drinking binge to prayer. The pressure was extraordinary, and school was never perceived as a priority. The family was first. Anna joined HPAC at school; it was her chance to be heard. Her project addressed youth development and the hurdles youth can face. Three years later, the school is now working with the kids and community to find ways to build trust, and is exposing them to opportunities outside of the community, in the hope they will return with the training needed to access available jobs. Meanwhile, Anna kept in touch with HPAC all during her first year of college. This light haired, meek girl from Appalachia will be the first in her entire family to graduate from college, and she plans to go on to pharmacy school. She has become a “powerhouse” of change. Community health deeply matters in any conversation about the broader health landscape of the United States, and should be an essential consideration when drafting new health policies at all levels of government. Community health is important because it is within communities that meaning is created. Everything that an individual knows about health, illness, and healthcare is learned from their community. If there is rampant distrust within a community about a system of care, individuals learn to distrust the system, and the cycle will continue. Fortunately, the converse is also true: if enough individuals build a new definition of healthcare and individual health, the collective community mindset will shift toward a new perspective and way of life. Communities must shape the answers to our health. Healthcare professionals must build from their knowledge and the community to help revolutionize the status quo and banish the expectation that health is not a responsibility for all of us. Health must be recognized in the 21st century as a shared endeavor rooted in the community. Collectively we must all use our assets to create a culture of wellness. The way that we think about, operationalize and connect with one another is the strongest determinant of health for us individually and for our families. HPAC, operationalized with the help of AmeriCorps members, hospital and university partners and community stakeholders, has impacted the health of an estimated 10,000 residents of Ohio. 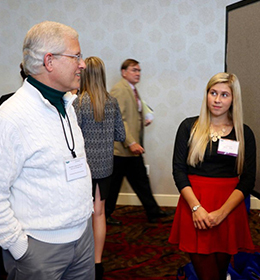 Scholars Day, a culminating event for students to share their work, exchange trade secrets and gain new partners, yielded over 900 public health community connected projects from rural to urban Ohio. Students addressed plans and programs they had made and operationalized on issues such as the heroin epidemic, healthy eating, and what to do about stress. Please see the links below to learn more about the program, Scholar’s Day and why we must all respect the origin of kumbaya, if we are to utilize our existing assets to build the contextual capacity to drive a sustainable, healthy system. Each of us matters in this fight to keep our states healthy, and collectively we are more than our individual parts. The solution to our crisis lives within in us. By engaging citizens in the planning, implementation, evaluation and ongoing maintenance of health in their communities, we can take personal interest in, responsibility for, and pride in our communities’ improved health outcomes.